Vigor Enterprise brought to Doha a riveting One Day Seminar – Bee a Great Leader – by Global Keynote Speaker – Paul Rigby on the 3rd of April at the Al-Jazeera Network Academy and was sponsored by Al-Jazeera Academy. 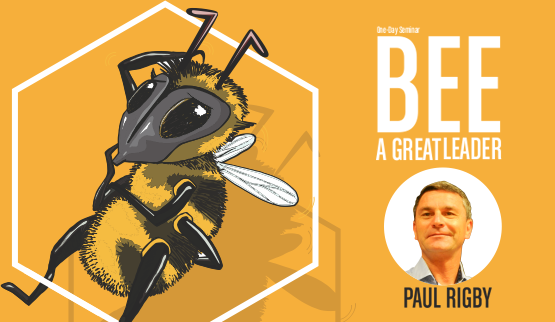 The Seminar was based on Paul’s recent book “The Bee Book” – a parable about change, innovation, employee engagement and leadership. Paul thought attendees how to adapt their own leadership style in the context of change, innovation and employee engagement in general. He explored the core competencies of leadership needed and demonstrated their importance to attendee for the benefit of making their organizations “fit for the future”. It is worth noting that Paul Rigby is a regular keynote presenter and facilitator at global industry conferences. Paul helps organizations to lead and successfully transform businesses in times of change. He has an incredible energy and passion plus an ability to translate his hands on experience to the business world. Thank you for your interest in Vigor Events. Please contact us using the information below. For additional information on our services, please visit the appropriate page on our site. To get the latest updates from Vigor Events, subscribe to a newsletter or connect with us on social media. Floor 13, Al-Gas Tower, Ahmad Al-Jaber St., Sharq, Kuwait City, Kuwait. © 2018 Vigor-Events, All rights reserved.